Comfortable and functional, Spectator will make your relaxing time more entertaining with two, lighting cup holders to keep drinks close at hand. Great looking too, with contoured back cushions, chaise seats and single-needle topstitched detailing. Lean back and relax with soothing, power-reclining motion. 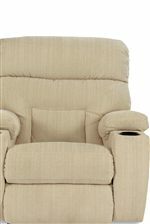 See the complete Spectator line for more reclining options and additional matching pieces. The Spectator 4 Pc Reclining Sectional Sofa with PowerRecline+ by La-Z-Boy at Conlin's Furniture in the Montana, North Dakota, South Dakota, Minnesota, and Wyoming area. Product availability may vary. Contact us for the most current availability on this product. 04C784 Corner Unit 1 62.5" 38" 44.5"
04M784 Armless Middle Unit 1 23.5" 39.5" 44.5"
The Spectator collection is a great option if you are looking for Casual furniture in the Montana, North Dakota, South Dakota, Minnesota, and Wyoming area. Browse other items in the Spectator collection from Conlin's Furniture in the Montana, North Dakota, South Dakota, Minnesota, and Wyoming area.